Inspired by the eclectic, bordering-on-bizarre cafes in Europe, in this dining table setting imperfections are not only important, they are celebrated. 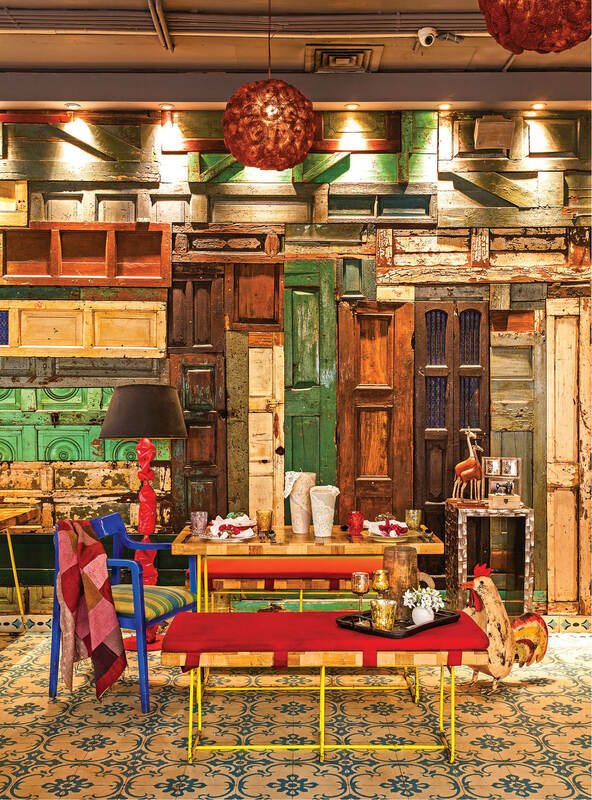 Colourful decor and quirky accessories are the perfect accompaniments. 1 Made from distressed mango wood and iron, these giraffes make for great accent pieces; ₹ 900 (each); Manan. 2 Accessories, especially photo-frames, add colour and character to a home. Get hold of this distressed mango wood one, with three slots for photographs, to make your living space stand out; ₹ 3,125; FCML. 3 What sets this enchanting box with a wooden base and ceramic top apart is the small sewing machine made on top of it; ₹ 2,350; Ishatvam. 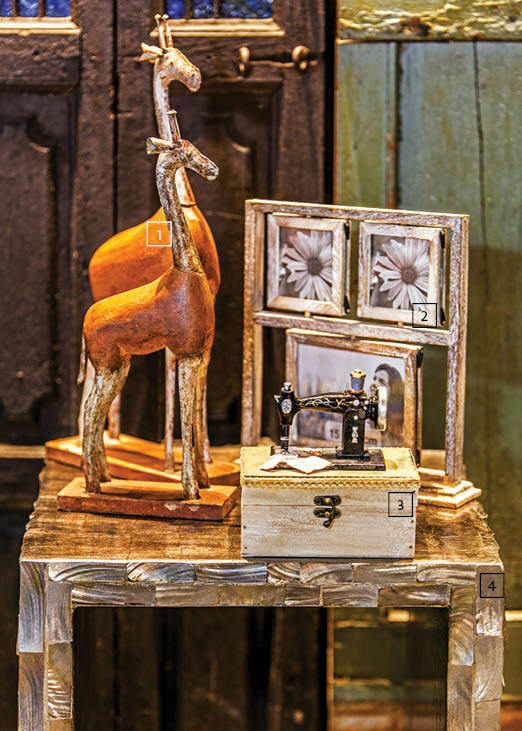 4 From knick-knacks and vases to photo-frames and showpieces, a pedestal can be a multifunctional piece of furniture. Featured here is the Pearlish Blue U-Table, which has been made from commercial wood board with real mother-of-pearl finish that has been coated with PU; ₹ 66,000; InV home. 5 In this dining table setting, quirk really works! 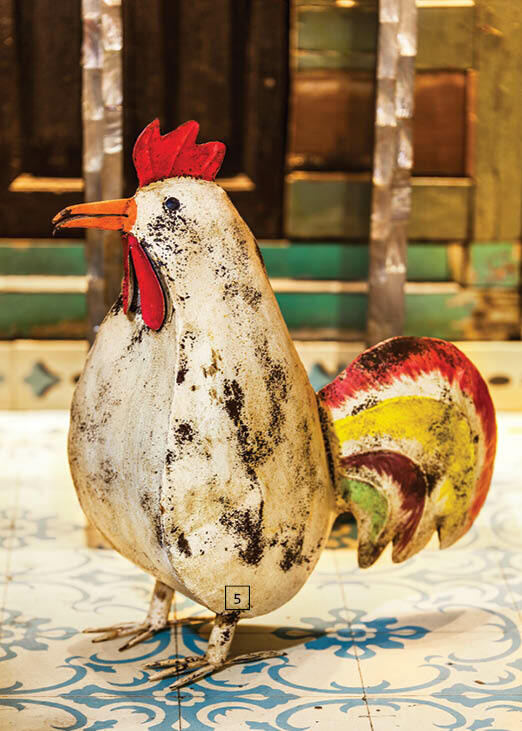 For we will all agree that a large vintage-looking iron hen, complete with chipped paint, can be quite the conversation-starter; ₹ 3,000; Neemrana Shop. 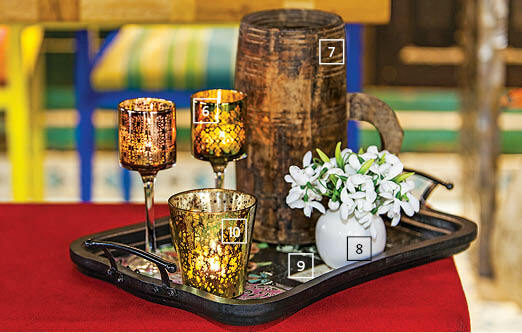 6 Play with light and shade with these glass candle holders. 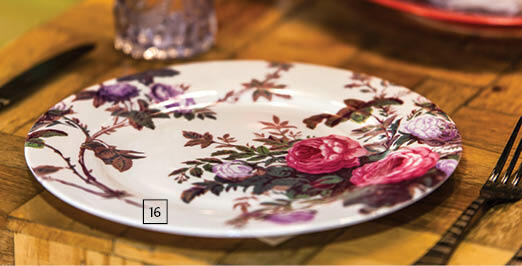 Pair two different designs together to add zing to the table; ₹ 395 (each); Pure Home + Living. 7 Titled Tribal Buttermilk Jar, this sheesham wood beauty is a great way to serve your favourite drink at a party or a family get-together; ₹ 1,000; Manan. 8 Saying it with flowers has never been easier. This ceramic pot with white synthetic flowers instantly brightens up your decor; ₹ 4,200; InV Home. 9 Serve your guests in style with this mango wood tray with floral motifs; ₹ 5,500 (set of two); FCML Home. 10 Use it as mood lighting or to add some romance, this votive with a heart on it is a glass apart; ₹ 160; Neemrana Shop. 11 On this table simple ceramic plates in different hues complement the eclectic look of the setting; ₹ 240 (each); Pure Home + Living. 12 A napkin is just a napkin, right? Wrong. Today, table settings have elevated them to works of art. Take the one featured here, for instance. A simple cotton-silk white napkin has been bunched together and fashioned into a flower with silk napkin ties; ₹ 1,550 (set of six napkins), ₹ 2,200 (set of six napkin ties); Shades of India. 13 Delicious food without a beautiful presentation can mar a dining experience. Here’s an alluring black stainless-steel cutlery set, with silver stripes to complete the picture; ₹ 18,995 (set of 24); InV Home. 14 Mix and match the glass Fierenze Tumblers, that come in several colours such as red, amber and purple and create a unique look; ₹ 325 (each); Pure Home + Living. 15 Looking for something chic and stylish for your home? 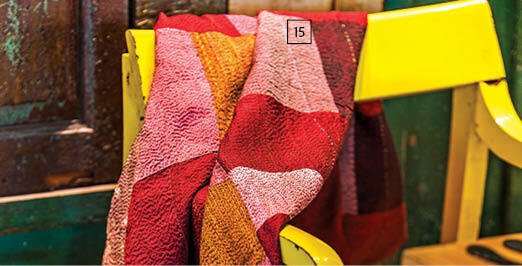 Grab this silk kantha patchwork stole that has been used as a throw in this setting; ₹ 4,800; Manan. 16 Beautiful plates make the food look even more appetizing. 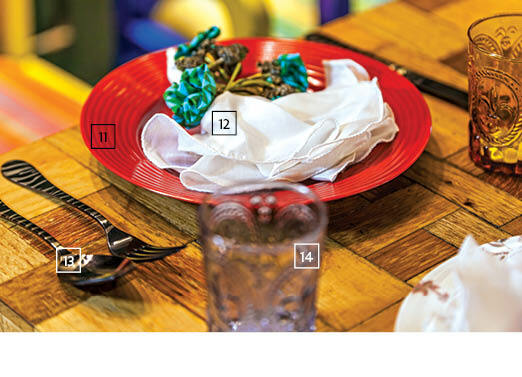 So eat out of these porcelain floral plates and be off on a gastronomic journey ­­­that is bound to satisfy all your senses; ₹ 1,250 (per plate); Ishatvam­­­. 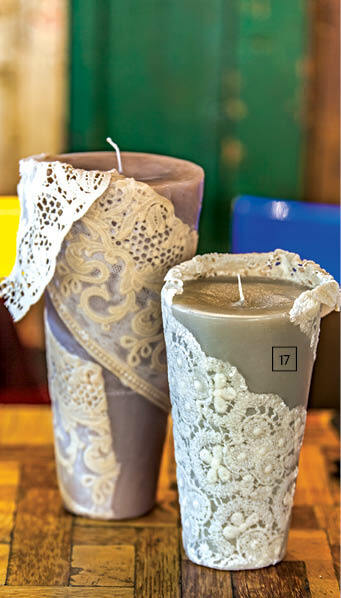 17 Create a breathtaking centrepiece at the dining table with the Torcia candles, which have silk lace wrapped around the wax; ₹ 10,500 (big), ₹ 9,500 (small); InV Home.